Sauteed Asparagus Recipe with Pancetta (BEST Asparagus) VIDEO!!! 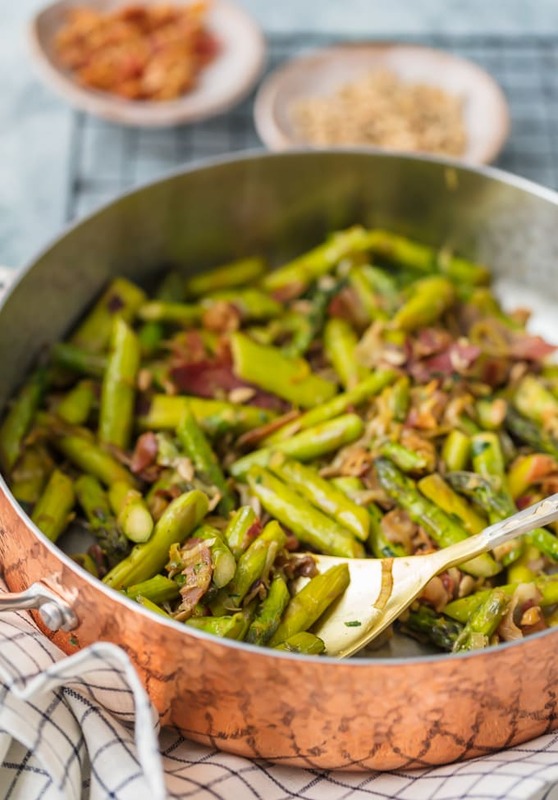 SAUTEED ASPARAGUS is the perfect side dish for any meal, and the Pancetta makes it even better! The leeks, garlic, and pine nuts add so much flavor to this dish…it just might be the Best Asparagus Recipe I’ve ever had. This Sauteed Asparagus Recipe with Pancetta is good enough to eat on its own, but it pairs well with other pork recipes. This delicious sauteed asparagus recipe might just be the BEST asparagus recipe ever! There’s an art to side dishes. We focus so much time on the main dish when we’re cooking, but the right side dish can make or break a meal. I guarantee this Sauteed Asparagus Recipe will definitely make the meal. Asparagus is a pretty classic side dish, but this recipe is better than any you’ve had. It’s filled with so many amazing ingredients, like thinly sliced Pancetta, garlic, leeks, pine nuts, and a little bit of citrus zest. All of that sauteed together to mix the flavors…this is by far the Best Asparagus Recipe I’ve ever had! 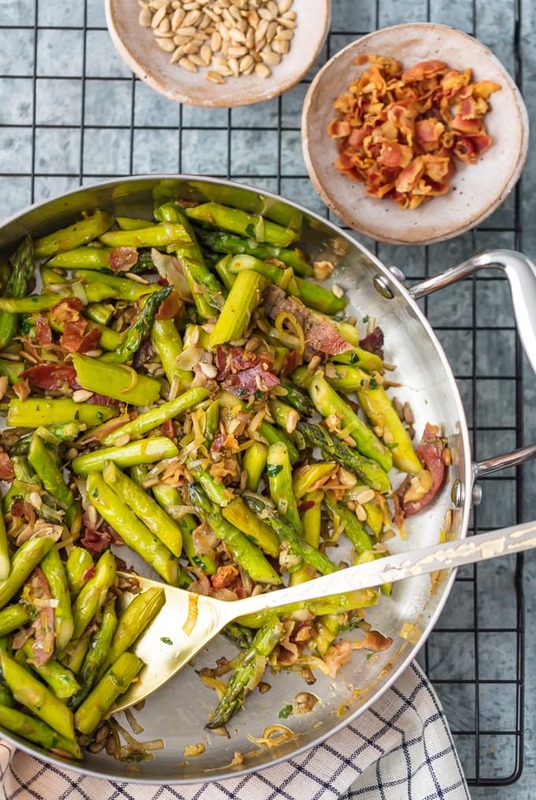 This Sauteed Asparagus with Pancetta is savory, but it also feels so fresh. 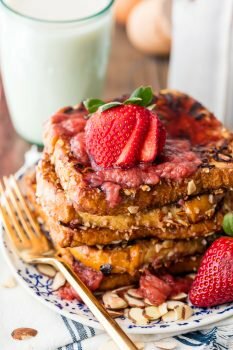 It’s a great holiday recipe for Easter, Thanksgiving, or Christmas, but it tastes just as good any time of year. 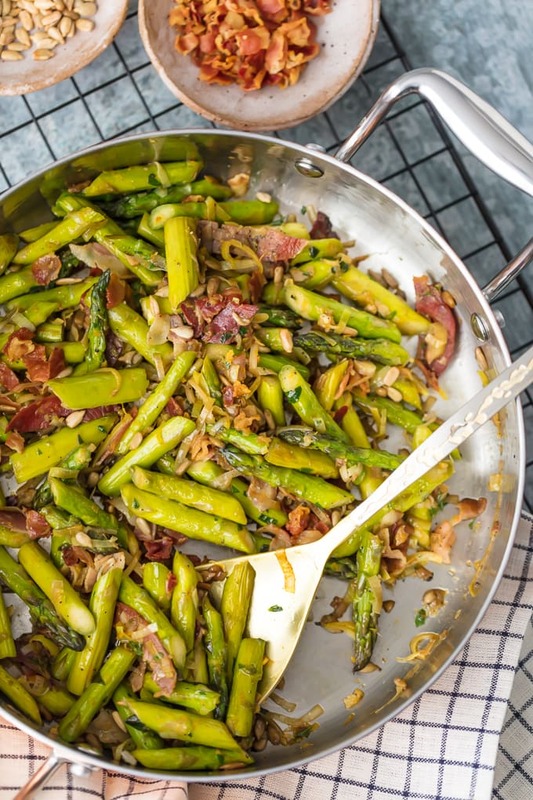 Try this Sauteed Asparagus with Pancetta for your next side dish. It’s the Best Asparagus Recipe you’ll ever eat! I love side dishes that mix fresh, healthy vegetables with extra flavorful ingredients. It’s the easiest way to make sure you’re packing in plenty of nutrients into your meals. I especially like this dish because there’s such a variety of stuff in here, and that Pancetta really knocks it out of the park. This sauteed asparagus recipe is the perfect addition to holiday festivities, because it seems like there’s never enough food on the table! This asparagus is both fresh and savory. It won’t weigh you down like other holiday dishes because it’s so light (but not light on taste). How do you saute asparagus? To “saute” means to fry in just a bit of oil. Sautéed Asparagus is a quick and easy side dish to make with your meals. To make simple sautéed asparagus, just add oil or butter to a skillet on medium heat. The asparagus will only take about 5 minutes to cook. Just watch for them to turn bright green and start getting tender–that’s how you know they’re ready. Add salt and pepper or any seasoning you like as they cook. Asparagus is an easy veggie to prepare for cooking. To trim asparagus, just bend the bottom part of the stem and it will easily break off where it starts to become woody. You can also use a knife to chop off the ends, just check for the really tough part and make sure you get all of that off. I know I might be going out on a limb when I say this, but I’m willing to do that because I believe it’s true. This is by far the BEST Asparagus Recipe ever! Asparagus is a great vegetable, and I’ve cooked it in many ways over the years. A classic sauteed asparagus, grilled asparagus, it’s all so delicious. But the Pancetta just adds so much flavor to this recipe, and it’s the perfect flavor combination. The toasted pine nuts add a little crunch, lemon juice adds zest, and the leeks just add more hearty, healthy goodness. 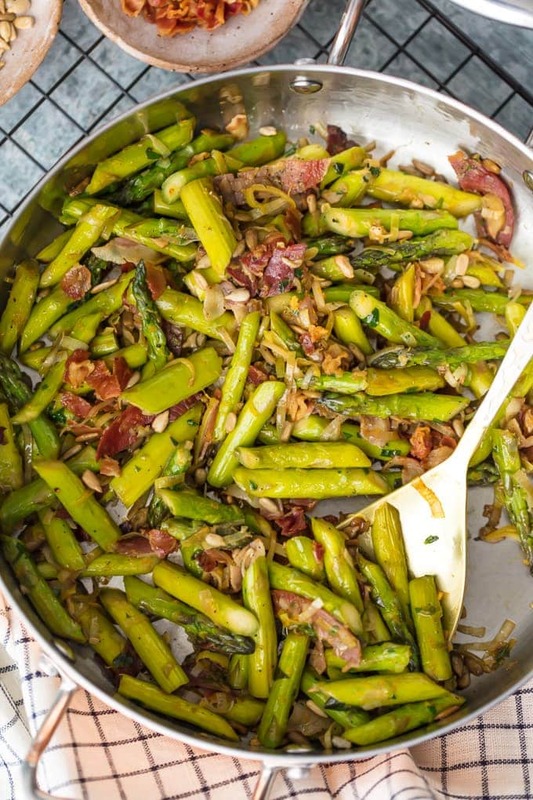 We absolutely love this Sauteed Asparagus with Pancetta and I know you will too! Cook it up as a side dish for your next meal and enjoy! If you’re looking for some more asparagus recipes, try our Grilled Lemon Butter Asparagus or this Three Cheese Asparagus Gratin. See the recipe card below for details on how to make this Sauteed Asparagus with Pancetta. Enjoy! 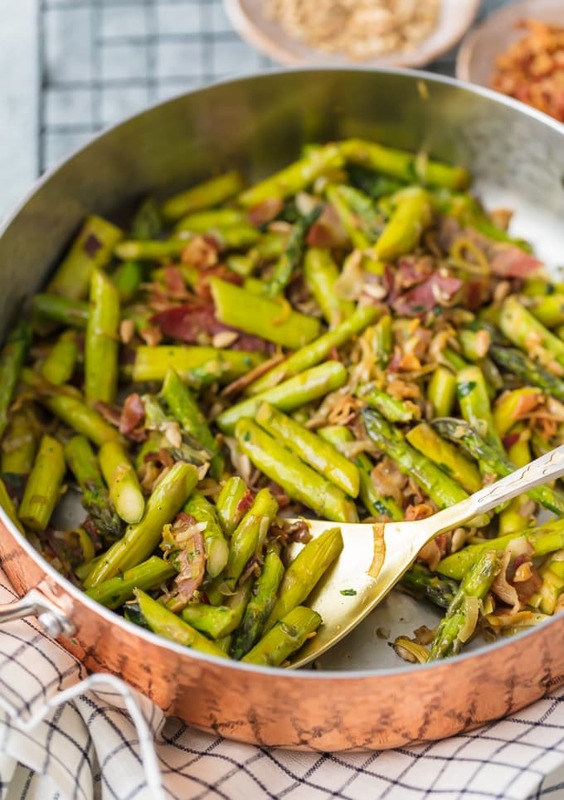 SAUTEED ASPARAGUS is the perfect side dish for any meal, and the Pancetta makes it even better! The leeks, garlic, and pine nuts add so much flavor to this dish...it just might be the Best Asparagus Recipe I've ever had. 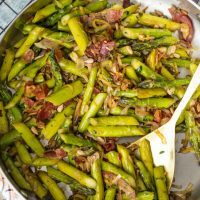 This Sauteed Asparagus Recipe with Pancetta is good enough to eat on its own, but it pairs well with other pork recipes. Place the sliced pancetta in a large skillet over medium heat. Cook until crisp and light golden brown. Add the butter, asparagus pieces and sliced leek, and sauté 3-4 minutes or until asparagus is tender crisp. Add garlic, lemon zest, orange zest, pine nuts and parsley, and sauté 1 minute. I love how quick this recipe is. 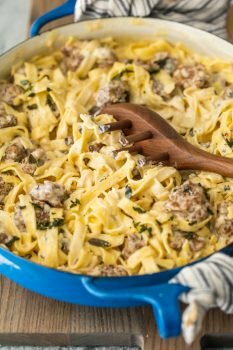 You can just whip it up really quick once the rest of your meal is ready!